If the S&P 500 falls 20% in the next year, how will your stock holdings perform? If the S&P 500 climbs 20% in the next year, how will your stock holdings perform? What if a strategy existed that would allow you to make good money in either of these scenarios? What if you could say, “Bull market, I win… Bear market, I also win“? Not many individual investors use this strategy. But professionals have used it for years to profit in both bull and bear markets. Now, I don’t claim to know when this bull market will end. But we’re more than nine years in… making this the longest bull market in U.S. history. You don’t have to be an analyst or an economist to know the next crash may not be far off. 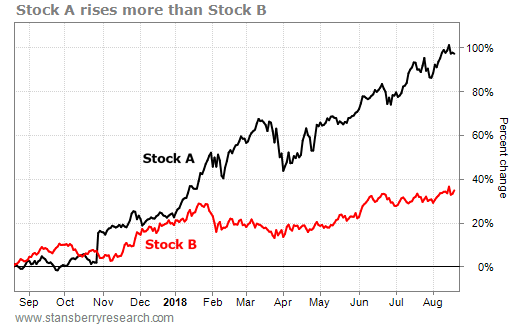 To take advantage, you only need to buy and sell stocks. Yet at this dangerous moment in stock-market history, your financial well-being may depend on your ability to use it properly. First, imagine the world’s strongest man pushing a big stone up a hill. On gradual sections of the hill, he moves the stone along at a good clip. On parts where the hill steepens, he progresses slowly. The stone is too big for the man to see around, so he just keeps pushing. Although he doesn’t know it, he eventually reaches the hill’s peak. And suddenly, the stone rushes away. It rolls downhill and settles in a valley. Nearly all the man’s uphill effort is lost. This is how most people invest. They know they’re on a hill. And as long as their accounts are moving higher, they’re happy. But they’re blind to what’s ahead. When stocks come crashing down, all they can do is watch in terror. The same big stone is sitting in the middle of a field. Thousands of strongmen are gathered around. And you’re in charge… You can call up any two competitors. Their goal is to push the stone forward rather than letting their opponent push them backward. And your goal is to choose the winner ahead of time. As long as you choose the “stronger man,” you win. In other words, of all the stocks out there, all you need to do is choose one that will outperform another. If you’re right, you make money. Now… if you’ve been pushing uphill and sense that we’re nearing the peak, wouldn’t you prefer to change games… and start playing on the level field instead? You buy one stock. And you sell another stock short. You put equal dollar amounts into each leg. And you treat the two legs as a single position. 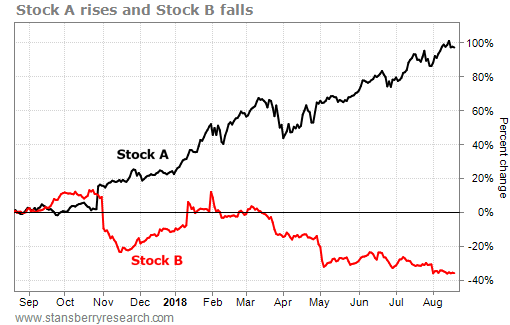 The result is a pair of trades that is “market neutral.” In other words, a pairs trade is equally likely to profit whether the stock market rises or falls. This market-neutral pair of trades is your level playing field. The stock you buy is the strongman you pick to win. And the stock you sell short is the strongman you pick to lose. As long as the stock you buy outperforms the stock you sell short, you make money. And the bigger the outperformance, the more money you make. 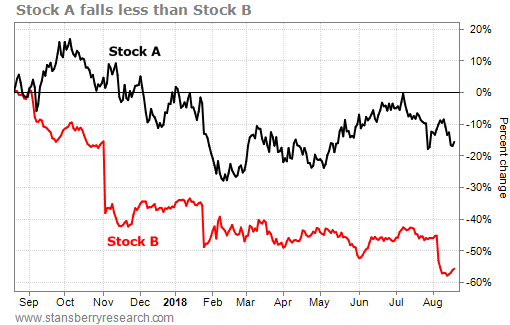 As you can see, in all three scenarios, the stock you buy outperforms the stock you sell short. And as a result, you make money in all three scenarios. You will only lose money if the stock you sell short outperforms the stock you buy. Notice that it doesn’t matter at all what the overall market is doing… This makes pairs trading a fantastic way to make money without taking any broad market risk. Pairs trades are flexible tools. If you have an idea about the markets, you can usually build a pairs trade to express that idea… and profit as it plays out. Now, if you’re confident the bull market will continue for years to come – without any significant interruptions – you may not want to use pairs trades at all. But I’m not so sure. The bull market could continue for six months to two years… Or it could end a lot sooner. That’s why I’m planning to use pairs trades in my DailyWealth Trader service in the coming months to help protect my subscribers’ wealth. I suggest you consider doing the same.